The moment I had to give up bread because I found out I have a gluten intolerance was a sad day. Who does not love those bread baskets before dinner at a restaurant or a tasty sandwich for lunch. Slowly more gluten free bread was available and once in a while I now have bread. When I bought my first dehydrator and started experimenting with homemade crackers I realized this would also be a way to make “bread”. My Raw Italian Buckwheat Bread is the improved version of a cracker recipe. My recipe for Raw Italian Buckwheat Bread could also be made in the oven if you do not have a dehydrator. When spreading the “dough” thinner you can actually come up with some amazing crackers as well. The Raw Italian Buckwheat Bread has a nice moisture and great flavor reminding of a nice summer day. The slices I can not eat in the next days are kept in the freezer. You can defrost them or slightly toast them. For a sandwich try with Radish Leaf Pesto, tomatoes, spinach and some avocado. 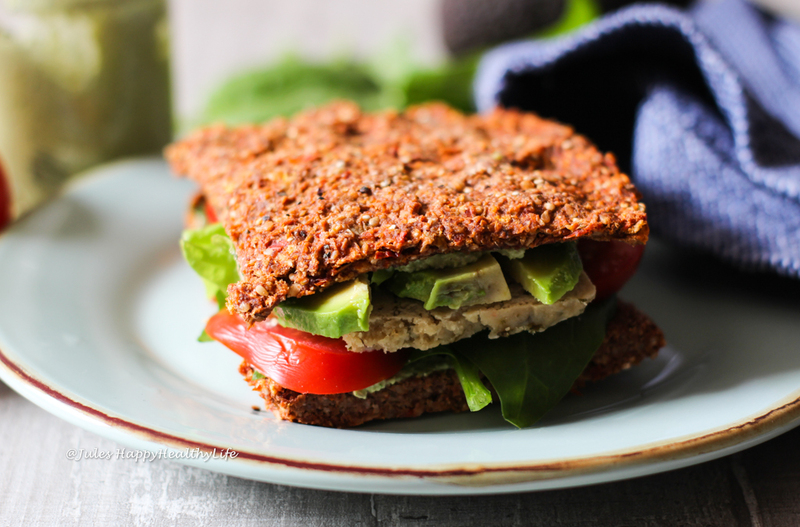 The Raw Italian Buckwheat Bread tastes great with avocado, tomatoes or toasted with some spread. This bread is nutfree and gluten-free. Buckwheat can easily be called Superfood. Even though you find “wheat” in the name buckwheat is not a wheat and naturally gluten free. With approximately 10 per cent protein in it, buckwheat is a star between many “cereals”. Again buckwheat is not a cereal. Further buckwheat does contain three times more Lysin, therefore helping the structure of your bones. For more information about sprouting please read Matcha Sprouted Hemp Bars. I like that I can take the bread out of the fridge and fill it. I can even prepare a nice sandwich to take to work. Buckwheat is accompanied by flax seed, adding Omega 3, some chia seeds, sesame. Sesame is a great source of copper, manganese, zinc, vitamin B1 and iron. Copper helps against inflammation as well. The dried tomatoes and fennel add vitamins that stay intact because the bread is raw, only dried below 115 degree Fahrenheit. Through the drying all the healthy benefits of your vegetables stay active since they are not killed by the heat. Raw Italian Buckwheat is filled with Superfoods like buckwheat, flax seed, tomatoes and healthy olive oil. What do you need for Raw Italian Buckwheat Bread? How to make Raw Italian Buckwheat Bread? The buckwheat is best sprouted but at least soaked for some hours. The sesame seeds should also be soaked. Wash and chop the vegetables into small cubes. Mince the garlic. Besides the flax meal put all ingredients in a big bowl. In small batches put the ingredients in your mixer and on pulse mix it until you have a doughy consistency. Doing this in small batches is a bit annoying but you will not overwork your machine and it is actually faster in the end. Your “dough” should still have some small chunks in it. When you are finished add the flax meal to the bowl and mix it with the other ingredients. Make sure the flax meal is really incorporated into everything. If you add the flax meal before everything will get really sticky. Divide the mixture in half and spread on Paraflex sheets on dehydrator trays. Use a spatula to spread the mixture evenly, it should be pretty thick. They will shrink later because they loose water. Dehydrate for 3 hours at 110 – 115 Fahrenheit. If you do not have a dehydrator you could also do this in your oven. Make sure it is always open an inch or so to let the moisture out. After those 3 hours cut your bread into desired slices. put another Paraflex with a try on top and turn upside down. That way you can peel the one Paraflex of. Instead of Paraflex you can also use baking paper. Dehydrate for another 7 hours at 110 Fahrenheit. The bread should not be too dry or you end up with thick crackers. If your slices do not come apart, use a knife again. Best store the bread in the fridge and freeze the slices you will not use in the next 2-3 days.